You are currently browsing the Fat Cyclist weblog archives for May, 2010. 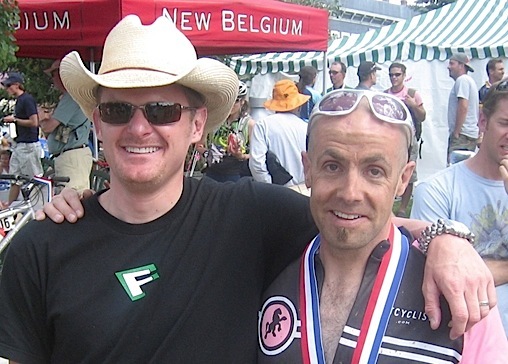 There’ve been a couple of stories going around about cheating and cycling. The highest-profile one, of course, is about Floyd Landis and his admissions and accusations. The other story hits closer to home: a woman who used another woman’s registration to race the Leadville 100 last year, and then — having placed second in her friend’s age group — got caught and prosecuted with a felony (plead down to a misdemeanor) charge. I’ve been thinking about both of these events and have a few random and unresolved things to say about them. Floyd was accused of doping. Floyd spent a lot of his money and time — and a lot of other people’s money and time — defending himself against this accusation. Floyd admitted he was lying. Floyd also accused a bunch of other people of doping and helping people dope. I can believe that he was lying before, but telling the truth now about himself and others. I can believe that he was lying before, is now telling the truth now about himself, but is making up a new batch of lies about others. I can believe that he lied before, is lying about himself now, and is also making lies up about others. Which is the most likely scenario? Well, probably not the third one, although it’s only a third more ridiculous than the other two options. But seriously, I have no compelling reason to believe scenario 1 or 2 is more likely. Why can’t I make a good guess? Well, I have already proven that I judge his motivations and degree of honesty poorly; it’d be stupid for me to think that I’m any better at it now than I was then. But one thing’s certain: no matter how much truth he’s choosing to tell now, he took a long time to choose to tell it. And I really doubt that this is a conscience-clearing decision; I have a very difficult time imagining that Floyd would be making these confessions and accusations if he had never been popped for doping. Everyone makes mistakes. No, that’s weak; we’re not talking about mistakes here. Everyone does bad things. But not everyone gets so twisted up in their errors that they can’t ever be taken seriously again, even when they make very serious allegations. Last year, Wendy Lyall (36) took Katie Brezelton’s Leadville 100 spot. 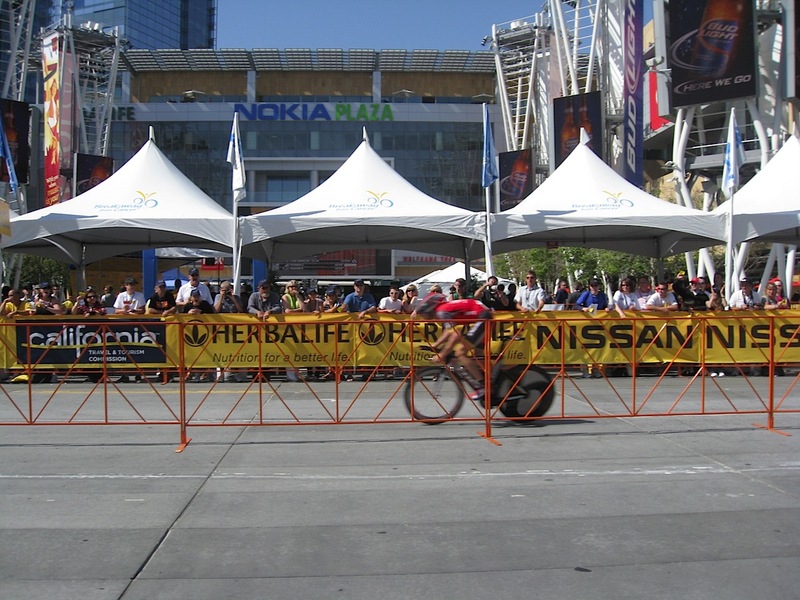 Then she finished second in the women’s 40-49 category. Those of you who are good at math will have noticed that most women who are 36 years old are usually not between the ages of 40 and 49. It’s incredibly rare, in fact. Most people, when talking about this story, focus on the — admittedly ridiculous — aspect of Mark Hulbert’s pursuit of felony charges against Wendy and Katie (now plead down to misdemeanor). As far as I can tell, nobody at all has mentioned Jacqui Wood, who was the person Wendy knocked off the podium by cheating. And of course nobody at all considers that a certain woman known here as The Runner might have found the legs and heart to push herself to be a mere 26 seconds faster if she had known that’s what it would have taken for her to be on the podium herself. If other people hadn’t cheated. I was racing the Brian Head 100 one year — I forget what year, honestly, because I did the race several times — and found myself in a surprising position early in the race: very far ahead of where I ought to be, relative to the field. I was surprised, yet pleased. It was only later that I realized that I had made a wrong turn, cutting a couple miles and a big climb off the course. I finished with a fast — though not winning or even podium-ing among my age group — time. So I didn’t say anything to the organizers. But who knows? Maybe I knocked someone out of the age group top-10 spot they were hoping for, or something like that. Until now, it never occurred to me that my not speaking up might have affected someone else’s race results. 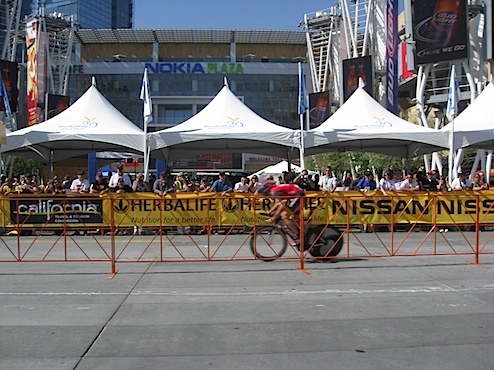 Now, however, I know: I should have told the organizers that I should be DQ’d, and now I really wish I would have. And maybe that’s the lesson here. When you race, the main thing your entry fee buys you is the right to compare yourself to other people. And if you cheat, you’re screwing up the yardstick for everyone. So here’s the giant epiphany, the big payoff for this big ol’ navel gazing session: cheating is bad. And as a sub-epiphany: you don’t know who you’re damaging by cheating, nor how much. And as a tertiary minor epiphany, if you’ve been caught cheating — as opposed to openly confessing it, you can forget about moral high ground. It’s almost enough to make me consider cutting back on the EPO. After the season ends, I mean. PS: The last real day of school for the kids is today; we’re going on a little vacation. I’ll be back Tuesday. PPS: All profits from the Johan Bruyneel collection continue — through the rest of this month — to go to Team Fatty’s LiveStrong Challenge. Read details here, then go get yourself something Johanesque to wear here. A Note from Fatty: You probably know Noodle from her incredible “100 Miles of Nowhere” video last year. Well, she continues to be a remarkable supporter of Team Fatty in our fight against cancer. Well, she crashed into a patch of poison ivy on Day 4 of her Trans-America ride to raise money for Team Fatty Austin, broke her wrist and blacked out, and had to be airlifted to the hospital. She’s back in New York and on the mend, but I’m sure it would mean a lot to her if you dropped by her blog and left her a comment of support. You can also follow her on Twitter. Between the big LiveStrong / World Bicycle Relief fundraiser, my trip to Tucson and my trip to California, Johan Bruyneel had done plenty of nice things for me (and others lately). Back in Europe and I wanted to send you a quick email. First, it was so great to see you and Lisa on Saturday at the TT. 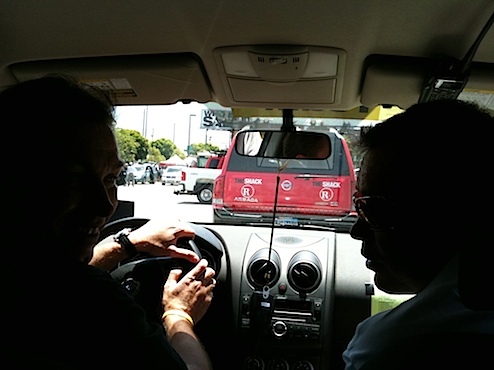 We enjoyed having you by the bus and in the car for the ride behind Mura! It was an experience for me and Eki too, as normally there’s a quiet mechanic sitting back there!! Secondly, thank you for all you’ve done and continue to do for all these philanthropic organizations. Whether it be for LIVESTRONG, World Bicycle Relief, Amgen Breakaway from Cancer or your nephew in need of a new kidney, you continue to inspire me and remind me that it’s about more than just winning bike races. From the comments I’ve read on my Twitter and Facebook pages and your blog, it’s safe to say that many people are inspired by you as well. 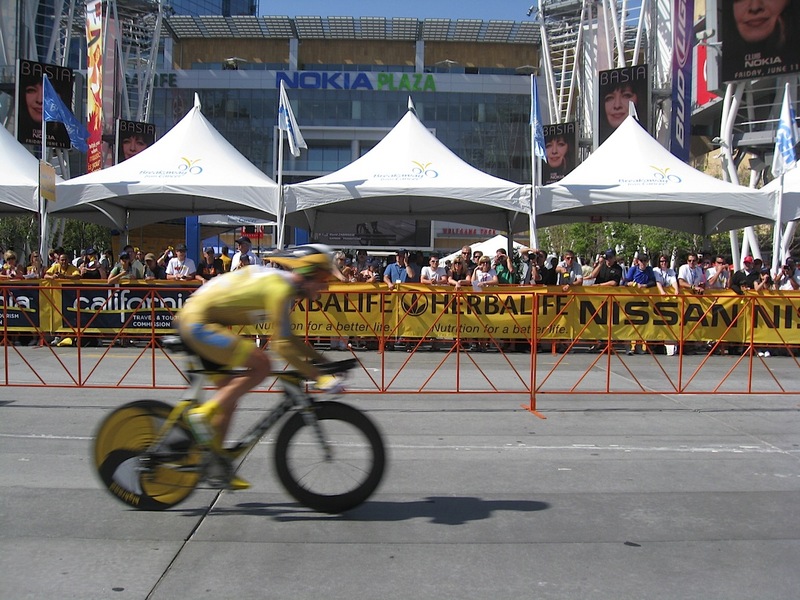 From our discussions, I know you have some big fundraising goals for Team Fatty at the LIVESTRONG Challenges. So I was thinking of a way that I can help the 2010 Team Fatty. What about if we donated 100% of the profits from my online clothing store — from Wednesday, May 26 til the end of May — to Team Fatty’s goal in support of LIVESTRONG? 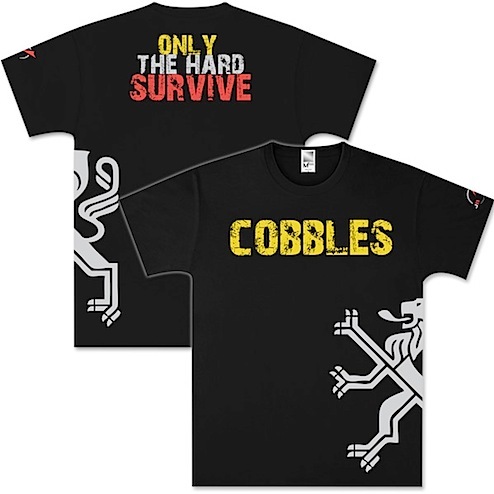 Whoever buys anything from the online store, we’ll give all the profits to LIVESTRONG via Team Fatty. I think that may be a simple way to help you and your team out. Let me know your thoughts. Let’s also talk more about the other idea we discussed on Saturday. Something to think about when the season is over. Well. That’s kind of awesome, isn’t it? There’s lots of other cool designs there, too. 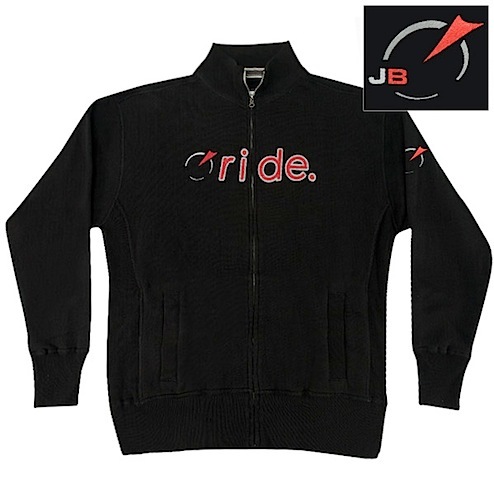 So: check out the Johan Bruyneel Collection here. You’ll get some cool clothes and you’ll be helping Team Fatty fight cancer. PS: If you haven’t joined Team Fatty in our fight against cancer yet, you should. For one thing, we’re doing something important here. For another, the more — and sooner — you raise, the better your chances of winning something outrageously cool. And I’m not being hyperbolic here; the stuff I will be announcing soon is going to make your jaw drop. And — get this — money you have already raised is going to improve your chances for winning every contest I run. So, just hypothetically, imagine that I’m going to give away four really amazing prizes in the next few months (those of you who have followed this blog for a while might have an idea what an “amazing prize” might be). And suppose you sign up right now for Team Fatty in any of the four cities, and you raise $500 before the first contest is even announced. Well, that $500 gets you chances to win in all four of those big giveaways. In short, join Team Fatty, raise a lot of money, and do it soon. You may win something nearly too awesome for words. Before I get to the conversation we had when driving behind Dmitriy Muravyev, I’d like to give you a little insight into Johan Bruyneel. 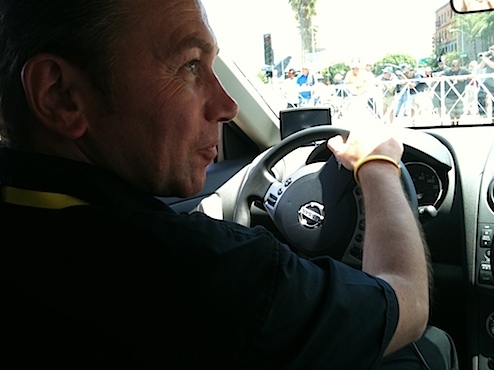 I am confident that Bruyneel never touched the brake around any corner during the drive, which meant — until I learned to always keep a hand on the overhead grip — that I was being flung left and right, forward and backward. 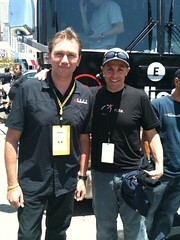 I’m pretty sure that Bruyneel was one of the stunt drivers for The Fast and the Furious. 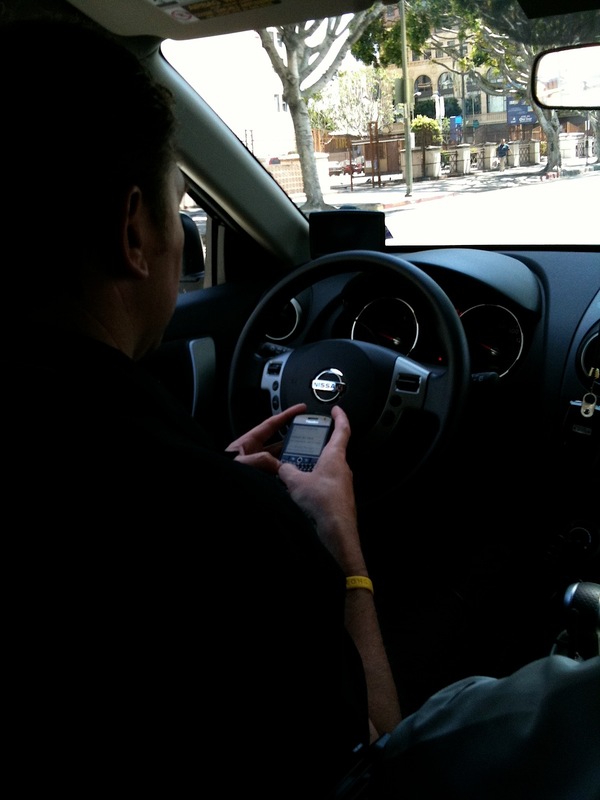 Meanwhile, Bruyneel was talking with me, talking with Eki, talking on the phone, staying within twenty feet of his racer, and checking email. Which, on one hand, was a little disappointing. One of the things I was really looking forward to was the radio back-and-forth. 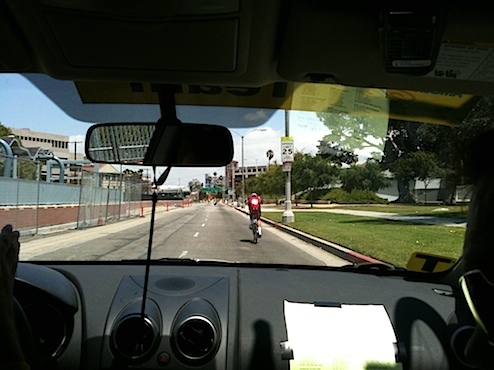 On the other hand, I was surprised to learn that any rider with a car behind him wouldn’t have a radio. Also, as I watched Dmitriy’s speed hit — and pass — 30mph on the flats, I wondered how anyone could call that “taking it easy.” Especially since Dmitriy passed the racer ahead of him about a lap into the two-lap course. “So what kinds of things do you tell racers in a time trial if they do have a radio?” I asked. “Tell me what you do on the radio differently between Lance and Levi,” I pressed. Which made me think: if I were a professional cyclist with a radio in my ear, I would want my director to speak to me in rhyming couplets. “There’s a good crowd out,” remarked Johan at one point (I should note that I’m not ignoring stuff Eki said; he simply didn’t say much. He was busy tracking and noting splits.). So you know that plan you were cooking up where you’d jump in front of Johan’s car and demand an autograph from whatever rider happened to be in there? Yeah, probably not so great of an idea. “We should,” agreed Johan. And then he went on to detail his idea — evidently he already had something in mind. Something really, really cool. But then he made me promise not to reveal what it is just yet. 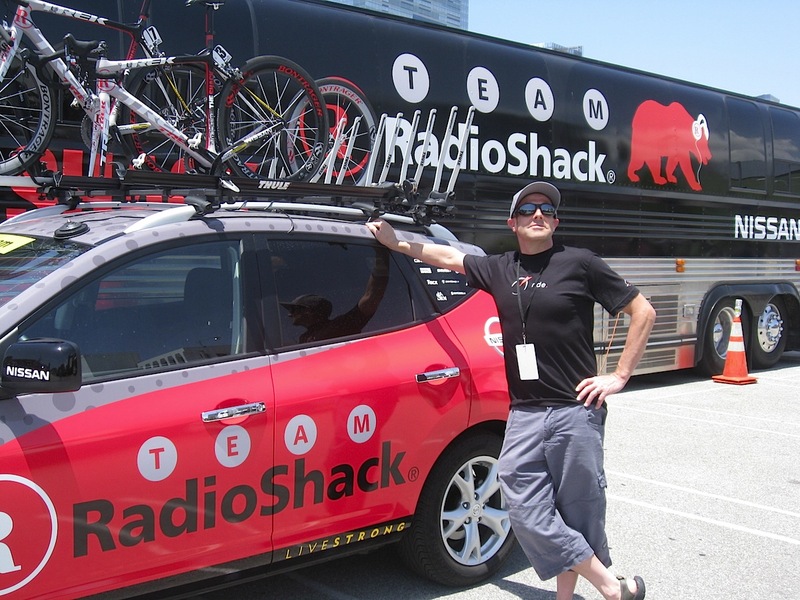 Of course, my ride didn’t last all that long — about 45 minutes or so — and then it was time for someone else to get a turn riding in the team car — the RadioShack CEO, bigshots from Trek, Matthew McConaughey, and other people who are 80% as famous and beloved as I am. After that, The Runner and I went and hung out at the finish line, watching the racers come in for their first lap time check and then for their finish. And really, it’s just amazing how fast these guys are. I mean, most of them were faster than me. As we wandered around, we ran into quite a few people who read the blog. And while it’s always a little weird having someone recognize me and ask for a photo, it’s a gratifying and cool kind of weird, because every time someone wants to say hi, it’s because they’re glad to be a part of Team Fatty and what we’ve done — and what we’re doing. And believe me, we’re going to be doing some awesome stuff soon. Stay tuned. 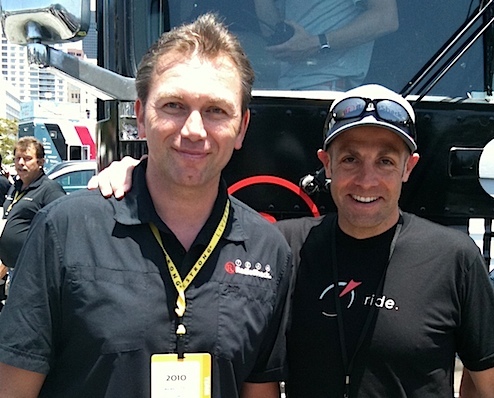 Here’s my take on Johan Bruyneel: I didn’t see any of the planning and strategy part of his job, but I think the results of that pretty much speak for themselves. What I did notice about Johan, though, is he’s an incredibly centered and calm person. In the middle of a big race day, he was completely calm and at ease. My guess is that this kind of stability and grounding counts for a lot when you’re a nervous racer under a lot of pressure. And I think it goes without saying that Johan’s got his heart in the right place, and has a mind that lets him make a difference. I mean, think about it: he turned a joke post I wrote back last December into a big fundraiser in the fight against cancer, a big fundraiser for World Bicycle Relief, and gave a normal guy unheard-of access to a pro cycling team. I admire Johan; he’s a great guy. And all in all, this wasn’t a half-bad day. It’s really a shame that I’m not a cycling journalist. Or a journalist at all, really. Because if I were a (cycling) journalist, maybe it would have occurred to me — at some point during the past five months or so — to prepare a list of questions or things to talk about during my ride with Johan Bruyneel and Viatcheslav “Eki” Ekimov, the director and assistant director of Team RadioShack. And then I would have been more ready to take advantage of the kind of opportunity most cycling journalists dream of, but never get. But I’m not a sports journalist. I’m I dork with a blog. So I just assumed that we’d talk about biking stuff, and I’d watch them at work, and then I’d write about what happened. Which is what I’m about to do. The “write about what happened” part, I mean. The other part is done with now. 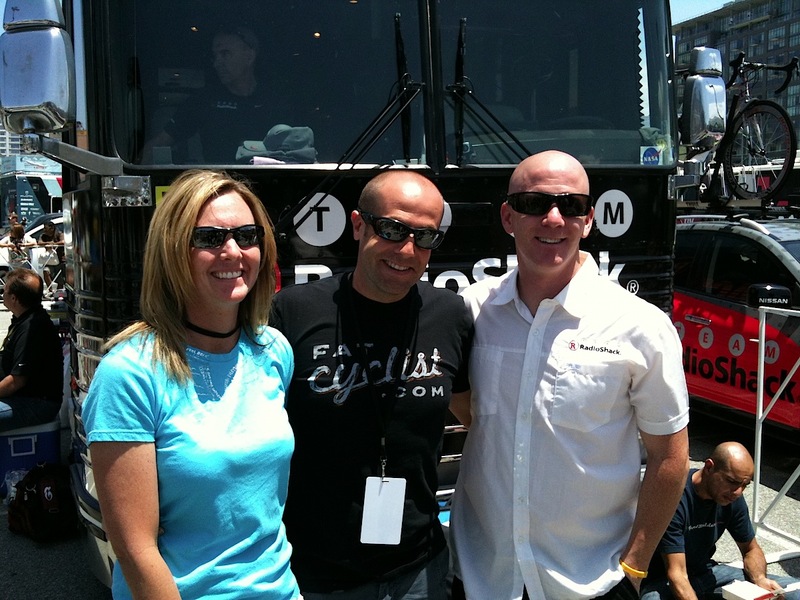 The original plan for my trip to the Tour of California was to bring the whole family. There was just one problem with this, however. The Tour of California had the gumption to happen right during finals week for the kids. And without going into details, I’m simply going to say that missing finals right now would not be a fantastic idea for some of the kids. Plus, none of them wanted to go. I think this has to do with an ongoing generational curse passed along from paternal Nelsons to their kids. Just as my father could not get me to be interested in hunting and fishing, my kids simply do not dig the bicycle. So The Runner and I went. The morning of the time trial, The Runner and I woke up and went on a run, going from our hotel to the race venue, where they were just starting to set up. Now, I know that as a cyclist, I ought to despise running, but The Runner is making a convert out of me. 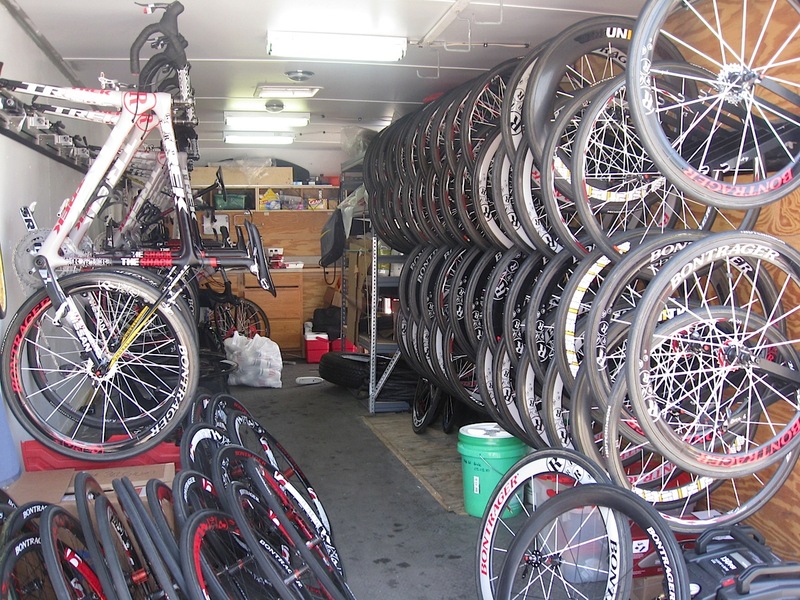 While the logistics of riding while traveling can be pretty daunting, running gear requires no additional luggage. Plus, I have to say that running was actually a great way to get a sense of the part of LA. By the time we had run five or six miles, we had picked out all the restaurants we wanted to eat at for the trip, and knew exactly how to walk to all the places we needed to go. And — I’m dropping a hint here — I need to stay in running shape because I’m working on a Team Fatty LiveStrong fundraiser that I think runners will like. A lot. More on that soon. 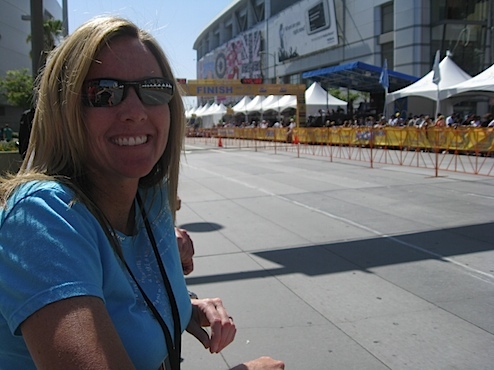 After cleaning up, The Runner and I headed down to the race venue to pick up the VIP passes that Amgen had kindly provided us with. Since this was the first time I have ever had a VIP pass at any event, I had no idea exactly how much wonderfulness one of these passes gets you. Specifically, it gave us access to bathrooms with plumbing. And to a never-ending buffet. Most importantly, though, it meant that whenever we saw event staff blocking an entrance, all we needed to do was wave our passes and waltz on through. It was like having the keys to the city. Before long, I started keeping my nose in the air and referring to everyone without a magical lanyard as “OSIPs” (Only Somewhat Important People). But really, the head-expanding part of the day hadn’t even begun. 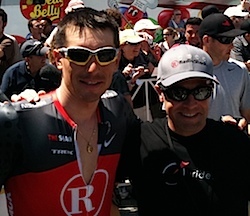 I was told I’d be riding with the first Team RadioShack racer to do his TT: Dmitriy Muravyev. 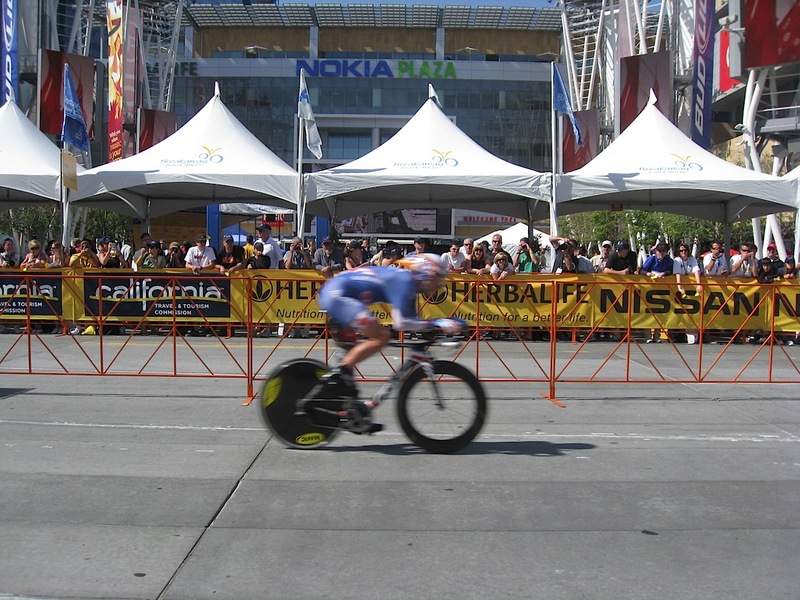 His start time was 1:40, but I should be at the team bus by 1:00. I showed up at the bus, which had a fence around it, and a two- or three-deep crowd all around it. Trust me, it felt strange — in the most ego-expanding way possible — to be escorted past the fence and allowed the run of the place. So of course I immediately started asking if I could have my picture taken with pretty much everyone and everything. Note that in the photo with Johan, I have cleverly changed into a t-shirt from his new line of apparel, not to mention a Team RadioShack cap. Hey, I know where my bread is buttered. 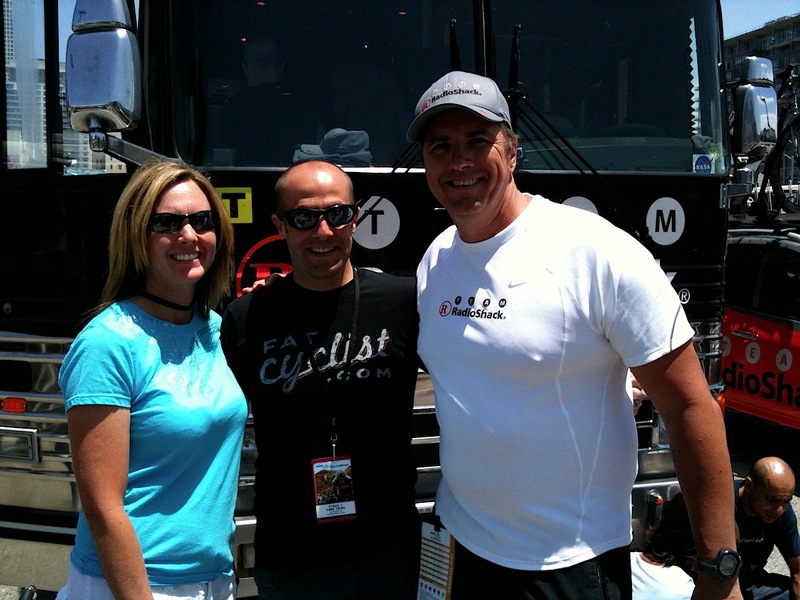 The Runner and I got a photo of us with Glenn, who took care of us both in Tucson and in LA. I’m going to interview Glenn someday soon. He’s got some stories to tell. 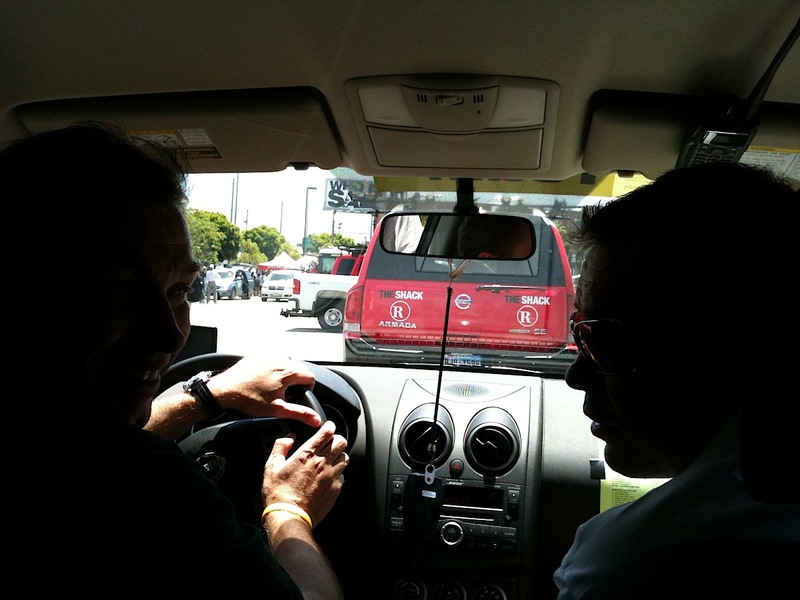 Then we went into the inner sanctum — the tour bus. Which was nice, but I didn’t feel very comfortable inside — kinda like I was told I could hang out in someone’s house, even though the home owner was inside getting ready for a very important business meeting in just a few minutes. OK, I might have made that part up. So as Levi — usually the friendliest guy in the world — stepped out of the bus and started warming up, I avoided even making eye contact. 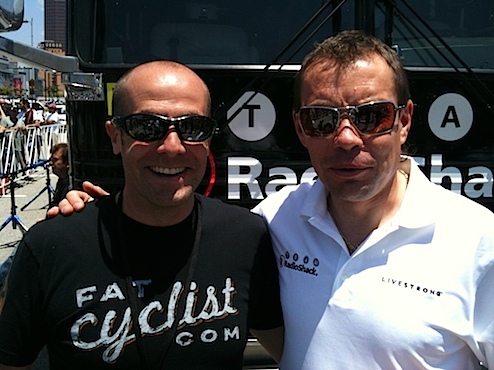 Dmitriy makes me feel much better about my own cyclist’s tan. That’s a lot of carbon. At about 1:35, Eki and Johan step out of the bus. “Let’s go,” they say. I climb into the back seat. “You’re the mechanic for this racer,” Johan tells me. Which is of course just fine, as long as the Dmitriy doesn’t mind ten-minute tire changes. “It’s 1:38 right now,” says Eki. All of this said very, very calmly, by the way. Meanwhile, I am considering the fact that if I were driving behind one of my racers and I were in danger of missing his start, I would be completely freaked out. “1:39,” says Eki, as Johan pulls past a line of seven or eight other team cars, each of them waving him past. He’s next. “1:40 now” says Eki. Johan calm as can be. We pull into the right spot for Dmitriy to go by. 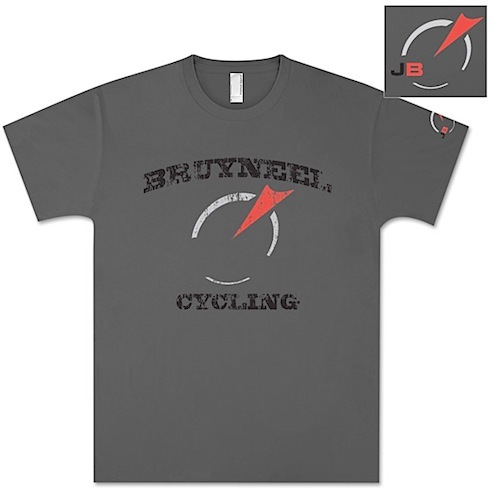 Bruyneel watches. Calm. Matter-of-fact. And then, approximately nine seconds later, Dmitriy goes by. And this presages what the next forty-five minutes or so will be like. Which is what I will talk about in tomorrow’s post. for which i am so well known. go. 1:40 is his start time. I’m so excited I can hardly breathe.